Modern armed conflict represents a significant risk to global health. This risk is partly inherent in the use of mass violence to advance political goals but also arises in large part from the contemporary trend of warring parties failing in their duty to abide by International Humanitarian Law. The deliberate targeting (or negligent destruction) of civilian and health infrastructure, the endangerment of health workers, and the subjection of a civilian population to starvation, unnecessary forced displacement, and other cruelties are war crimes which should not be normalized. As well as the direct toll of morbidity and mortality that they bring in the form of short-term injuries and deaths, these actions dramatically increase the risk of communicable and noncommunicable disease incidence and simultaneously reduce the ability of a society to prevent and control such risks. Armed conflict degrades the capacity of health systems to gather vital data and plan effectively for future emergencies, and all of these impacts can persist long after the guns have fallen silent. A fuller understanding of the many and various ways in which warfare affects public health (in the separate but linked senses of the professional discipline and the collective health and well-being of the public) would be highly beneficial to international policy-makers, humanitarian workers, and health professionals of whatever background who work (or are planning to work) in or near conflict zones. Warfare is an integral component of human history. With relatively few exceptions, it is responsible for the formation of our national borders and is also the means by which nation-states defend those borders. It is the greatest existential threat to humanity (especially since the development of nuclear weapons) and yet also the catalyst for much of our most inspiring art, most admired historical figures, and most advanced lifesaving technology. It is an effective tool of hegemonic oppression, massively impoverishing the countries in which it is fought while simultaneously enriching those who facilitate it by manufacturing and supplying the necessary armaments. It perpetuates itself through intergenerational cycles, as the prior aggressions of our neighbors are generally felt to justify those which are perpetrated against their descendants. It transforms sons, brothers, and husbands into heroic martyrs, trading their lives for a transient immortality which only serves to further sanctify the conflict in the eyes of many and generally forgetting the names of all the women and children who died along the way. It shatters, bankrupts, displaces, poisons, traumatizes, and embitters whole societies, and yet many leaders still continue to see it as a legitimate tool of politics and statecraft. The boundaries of the modern “Middle East” were created in the ruins of World War I, as the soon-to-be victorious allies privately divided up the spoils of the disintegrating Ottoman Empire. The repercussions of those century-old decisions still materially affect the lives of millions. In recent years this influence has been felt most strongly through the reactionary violence of the Islamic State (or “Daesh”), whose ambition has been to create a region-spanning caliphate which forever dismantles the boundaries created by the Sykes-Picot Agreement. However, although attention is inevitably drawn to those deaths which are the direct result of violence, it should not be forgotten that armed conflict has also killed many millions of people who never came anywhere near the front lines. For example, the same global war which birthed today’s Middle East also gave rise to a global outbreak of communicable disease, the “Spanish flu” pandemic, which killed more people worldwide (50–100 million by most recent estimates) than died in all the battles of 1914–1918 (Flecknoe et al. 2018). The mechanisms by which conflict can lead to outbreaks of communicable disease, as well as exceedances of noncommunicable diseases, and how these can be prevented and/or controlled, will be the primary focus of this chapter. Recommendations, both individual and societal, for improving the health status of civilian populations in conflict zones will also be discussed. “Armed conflict” and “warfare,” terms that from here onward will be used interchangeably, exist on a spectrum of human violence from the interpersonal (i.e., assault) to the group level (i.e., gang violence) all the way up to sustained multination hostilities (i.e., a world war). Every level on this continuum of disharmony carries the potential for both direct and indirect health consequences. For example, a violent mugging will often cause physical cuts and bruises, which may be the most obvious effects of the encounter from an outside perspective. However, the mental health impacts of a traumatic and disempowering experience can be far slower to heal and are likely to exert a significant negative effect on the victim’s professional and personal life. Similarly, a war (usually defined as an outbreak of organized mass violence leading to 1,000 or more battle-related deaths within one calendar year) invariably has long-lasting indirect impacts as well as its more immediately obvious ones. This is true for international conflicts involving two or more opposing nation-states and, for civil wars, fought either between the government military and nongovernmental armed groups or sometimes entirely between such non-state actors (ICRC 2008; Pettersson and Wallensteen 2015). Although the direct health impacts of a legally conducted war can be severe enough, it is important to notice that many of the most serious public health impacts of armed conflict are actually caused by war crimes. International Humanitarian Law (IHL) places an obligation upon armed groups to not target civilian noncombatants nor to either target or impede health professionals in their duties (ICRC 1949). If the rules of war were adhered to by all sides in modern conflicts, then a significant proportion of the public health impacts described within this chapter would not exist. In this sense, IHL functions as a classic “harm reduction” tool – limiting the excess damage that would otherwise be caused by an inherently health-risking behavior. The authors have no wish to normalize the distressing trend of warring parties disregarding these established rules. While denying vital imports of food and supplies, bombing public health infrastructure (such as water treatment plants, hospitals, and nonmilitary industries) and targeting medical first responders within an “enemy” population may be considered to be a good strategic way of weakening that population; it is also an unequivocal violation of both law and decency. The authors will continue to refer to “war” as it is currently fought but encourage the reader to bear in mind how much of a departure from established norms is the prevailing state of affairs. We strongly advocate for universal compliance with International Humanitarian Law as the most rapid and effective way of improving public health within conflict zones. Universal compliance with International Humanitarian Law could be the single most effective public health intervention for populations in conflict-affected areas, if it could be achieved. Citizens of nonauthoritarian countries should therefore use their democratic influence to advocate for the re-establishment of international deterrence against war crimes and the prosecution of individuals or governments (regardless of nationality) who deliberately target civilian populations, health workers, or public health infrastructure. Another point of terminology that is worth clarifying at the outset relates to the dichotomous connotations of the term “security” within this subject area. When that word is used in this chapter, it will be intended in the original sense of the Latin “se” and “cura,” meaning “free from care or anxiety.” Reference may be made to “food security” and “water security,” meaning a desirable state, from a public health and human rights perspective, in which these essentials of daily living can be easily obtained by the population. And yet in another meaning of the term, “security” has often been used as the justification for military investment and interventions which directly threaten the health and security (in the sense we mean) of millions. Acknowledging the paradox of these divergent connotations, the authors feel obligated, as public health professionals, to champion the former meaning of the term and to insist that as far as humanly possible military objectives should never come at the expense of population health. The ancient Roman historian Tacitus scathingly described the brutal battle tactics of a particular enemy chieftain as being akin to “creating a wasteland” and then “calling it peace” (Tacitus 1872, p. 372). Although this example no doubt would have been counted by some as a great military victory, it represents the polar opposite meaning of human “security” from the one that the authors would advocate. There is a great deal of overlap between the various impacts of conflict upon public health. Forced displacement, for example, adversely affects the food and water security of a population, makes them more vulnerable to communicable diseases in overcrowded camps, exerts a detrimental effect on their mental health, distances them from familiar health service providers for any chronic conditions they may have, and weakens their resilience against future disasters. Displacement therefore spans quite a wide range of public health topics and is difficult to discuss within any one single category. However, at the risk of some slight repetition, it was felt best to provide a categorical structure for this chapter, and an adapted version of the “3 Ps” framework was eventually chosen. We will begin by examining issues relating to the “prevention” of disease and then move on to discuss the “protection” of populations against existing ones. These categories can encompass both communicable and noncommunicable diseases in different but often complimentary ways. Next we will review the way that armed conflict affects health service “planning” and finish with a crosscutting discussion of public health considerations in “post-conflict” settings. It is hoped that this will provide a helpful framework for readers to locate their particular topics of interest, if you happen to prefer not to read the chapter from beginning to end. Preventative medicine is the most cost-effective and arguably the most essential form of healthcare. Not only is the prevention of a communicable disease outbreak or exceedance of noncommunicable disease a huge benefit in terms of the financial cost of treatment, it also represents a net reduction in human suffering, due to all of the associated intangible costs (mental health, family stability, etc.) that are thereby averted. Like public health infrastructure, preventative medicine is easy to take for granted, since it tends to only come to the attention of policy-makers when it fails. The successful prevention of negative health outcomes is also very difficult to ever conclusively demonstrate, which makes this type of intervention relatively unappealing to leaders who prefer having a list of tangible results to cite for any particular service or policy. And yet for all of its seemingly insubstantial and elusive aspects, high-quality preventative medicine for a large population is technically challenging to deliver, requiring good data collection, well-trained staff, and functional health infrastructure. These vital building blocks of prevention can all be disrupted or destroyed by warfare. Although, as already mentioned, direct attacks on healthcare professionals and services are radically discordant with the International Humanitarian Law, they are also sadly not uncommon and exert the (presumably) intended effect. Whether through injury, death or simply the intolerable risk of either outcome causing health professionals to leave the conflict zone, civilian populations in such areas are frequently left without significant protection against disease outbreaks. Health surveillance largely ceases, and the preventative efforts which would usually help to shield the populace from disease become far less effective. This dynamics cuts across all of the four Ps (prevention, protection, planning, and post-conflict) which make up the framework of this chapter and amounts to the indirect use of disease as a weapon of war. Although the general insufficiency of health workers in conflict zones will be touched upon again below, it should be borne in mind by the reader as a relative constant within this subject area. Modern conflict zones, largely as a result of the conduct of local armed groups, are frequently unsafe places for health professionals, and civilian populations suffer from a disastrous lack of medical assistance as a result (Fouad et al. 2017). The prevention of communicable disease is a multifaceted endeavor, which depends upon significant local infrastructure, human resources, and training in order to be effective. It is also made considerably more difficult when the population is displaced from their familiar environment, confined in overcrowded camps, malnourished, and denied access to safe drinking water or sanitary facilities. Displaced persons’ camps, as mentioned above, are ideal breeding grounds for outbreaks of water- and foodborne diseases such as cholera, dysentery, hepatitis A and E, and leptospirosis, not to mention measles, malaria, tuberculosis, meningococcal disease, and influenza. As armed conflicts (and the global population in general) have become more and more urban over recent decades, many cities in and adjacent to conflict zones have also become breeding grounds for the sort of disease outbreaks previously characteristic of refugee camps (Spiegel et al. 2010). Many of these diseases are easily preventable, either by vaccination or other basic public health measures, so their disproportionate prevalence in populations displaced by armed conflict is indicative of their root cause. Full prevention and control of communicable disease is effectively deliverable only by well-resourced local and national partnerships of the sort that modern warfare frequently makes virtually impossible (WHO 2014). Communicable diseases can spread through a variety of pathways – airborne, food- or waterborne, blood-borne, or transmitted by zoonotic vectors (such as mosquitos or fleas). Preventing the spread of such diseases entails containing or eliminating their source, interrupting the pathway of transmission, and protecting the vulnerable potential receptor. This inevitably requires reliable data on local sources of disease, a clear understanding of the relevant transmission pathways, and up-to-date intelligence on the population at risk, including vaccination status and other indicators of receptivity. This explains why the gathering of health surveillance data is such a vital tool for the prevention of and early response to infectious disease outbreaks. Whether through a lack of available staff or general insecurity, the disruption of surveillance systems inevitably leads to delays in recognizing and responding to spikes in infectious disease incidence, preventing adequate control measures from being implemented. In areas with very poor baseline levels of health infrastructure, it is possible that the influx of medical nongovernmental organizations (NGOs) which can accompany the outbreak of war could actually increase local health surveillance capacity. However, this hopeful possibility is modified by the degree to which those NGOs are able to operate freely in such a high-security context. Ismail et al. describe the challenges of implementing communicable disease surveillance during the Syrian conflict. These difficulties have been largely related to population displacement, insecurity, and attacks on healthcare workers leading to a loss of trained staff and equipment necessary to maintain effective monitoring systems throughout the country (Ismail et al. 2016). The sort of data collection that informs good epidemiological surveys can often be mistaken for malicious intelligence gathering by both military actors and by the population themselves. However, in the absence of such data, prompt and effective public health action against emerging communicable disease threats cannot be taken. Effective data collection is essential to public health prevention efforts which can avert communicable disease outbreaks that have the potential to cause massive loss of life. Although not an immediately obvious infraction of international law, the prevention by warring parties of nonmilitary civilian health data collection should be considered an indirect crime against humanity on this basis. Vaccination is one of the most powerful and cost-effective prevention strategies for communicable diseases that have so far been discovered. However, vaccination rates tend to fall rapidly in conflict zones as levels of access to the population and safety for health workers decrease. Other factors, including the aforementioned dearth of trained health professionals, the destruction and looting of healthcare facilities, cold chain failure due to interruptions in the power supply, and a lack of trust in medical NGOs, also exert a negative effect. Violations of medical neutrality by all sides contribute to this atmosphere of mistrust. For example, the Taliban are known to have frequently targeted vaccination workers (which helps to explain why polio and other vaccine-preventable diseases are rife in Afghanistan and parts of Pakistan), but this indefensible behavior is hard to disentangle from the fact that when US special forces were hunting for Osama bin Laden in Northern Pakistan, they sometimes disguised themselves as vaccination workers (Scientific American 2013). Any infringements of the inviolability of medical staff in conflict zones, whether aggressive or covert, can have severe consequences for the credibility and safety of genuine health professionals in that area. And those consequences fall most heavily on the civilian population, especially when a reduction in vaccine coverage leads to a reduction in the herd immunity which would otherwise protect against the re-emergence of vaccine-preventable diseases. In Syria, the proportion of children immunized against major vaccine-preventable diseases (polio, diphtheria, pertussis, and tetanus) declined from 80% in pre-conflict 2010 to only 41% in 2015 (Nnadi et al. 2017). In Yemen, a lack of herd immunity (among many other factors) caused by low vaccination rates has led to a number of large outbreaks of vaccine-preventable diseases since the conflict there began. The huge cholera epidemic is the best-known of these, but in 2017 the WHO in Yemen also declared an outbreak of diphtheria, with a total of 333 suspected cases including 35 deaths (case fatality ratio = 10.5%) reported from 20 governorates. A lack of available laboratory testing capacity forced clinicians to rely on clinical diagnosis of this outbreak, creating a further barrier to effective assessment and control of the disease (WHO 2017a). Once again, in an effort to avoid the normalization of war crimes, it is worth noting that humanitarian ceasefires have often been negotiated in the past in order to allow vital vaccination campaigns, food distribution, and other public health interventions to proceed unhindered (WHO 2018a). War is not an inevitable obstacle to full vaccination coverage and should not be treated as such merely due to a contemporary trend of military and/or political leaders disregarding the continued health of local civilian populations at the expense of military objectives. Violations of medical neutrality (which include combatants posing as health workers, as well as deliberately targeting them) should be condemned and, where possible, punished by the international community. Warring parties who oppose or obstruct humanitarian ceasefires to allow preventative public health interventions (such as vaccination campaigns) to be safely delivered in conflict zones should face sanctions and/or prosecution. 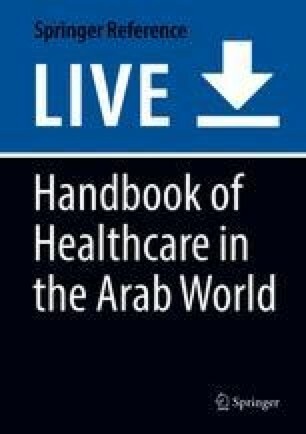 The Arab world contains the full spectrum of economic development and includes many middle-income countries which have undergone the epidemiological transition from infectious disease to chronic lifestyle-related disease prevalence. When hostilities break out in such countries, the health impacts of war occur in a context of relatively high risk for hypertension, heart disease, diabetes, and other conditions associated with longer life expectancy. However, the prevention of such noncommunicable diseases in conflict zones is equally handicapped by the prevailing conditions of war. Lifestyle-related disease prevention requires good-quality public health data systems, culturally appropriate behavior change strategies, and locally tailored community engagement in order to be successful. Healthy eating or smoking cessation campaigns in peaceful and prosperous nations may be held up as good examples of how this kind of work can be effective in the absence of armed conflict. However, although they are less technologically dependent, health promotion interventions designed to prevent noncommunicable diseases are no less affected by armed conflict than are vaccination campaigns. The safety and training of local health professionals remain a primary concern. In the absence of good faith guarantees from warring parties regarding medical neutrality, NGOs and other international health sector actors are unlikely to risk intervening. And there are numerous other factors that make noncommunicable diseases a particularly significant risk for conflict-affected populations. Regardless of their level of health literacy, populations subjected to high and chronic stress levels (whether through displacement or exposure to physical danger) are disproportionately likely to engage in behaviors linked to noncommunicable diseases. Increased rates of tobacco smoking, alcohol and drug use, and other risk factors for a wide range of chronic diseases are all reliably found in such populations (Forouzanfar et al. 2015; Jawad et al. 2019). Armed conflict also reduces access to routine medical care, whether through displacement or insecurity or the economic hardships (in countries without free-at-the-point-of-access healthcare systems) caused by either of the previously mentioned factors, so that the prevention or early detection capacity for noncommunicable diseases is invariably reduced. Although such links are difficult to prove, some types of battlefield tactics may also exert a negative long-term impact on noncommunicable disease levels within a population. For example, the relatively high incidence of some cancers and respiratory problems in parts of Iraq may well be linked to the use of chemical weapons during the Iran-Iraq War and/or the burning of the Kuwaiti oil fields and use of depleted uranium munitions during the first Gulf War. Full investigation of these possible health impacts of earlier conflicts is made more difficult by ongoing violence and insecurity in the country. Physical injuries, more likely to occur in conflict zones, often impose a financial burden upon struggling families but also create a psychological one, as can chronic stress. Mental health problems arguably sit somewhere in between the communicable and noncommunicable disease categories, since although they are not “infectious” in the sense that influenza or HIV is, they can definitely be contagious. Unacknowledged and untreated emotional/psychological consequences of severe trauma may manifest themselves in behavior which creates a secondary cycle of victimization (and attendant psychological consequences) for family members and especially for children. In cultures where there is significant mental health stigma acting as a barrier to anyone who might want or need to come forward for help, this risk of intergenerational cycles of traumatization is particularly high (WHO 2008). Prevention of mental health problems in conflict zones therefore necessarily overlaps with the topic of protection, which will be discussed in greater detail in the following section. The causal pathways between armed conflict and noncommunicable disease risk are likely to be complex and multifactorial, almost certainly driven by underlying stress responses, disruptions to healthcare provision, malnutrition, and physical inactivity. Further research into this pathway would be helpful to guide future interventions in this area. The logistics of health protection (i.e., keeping the population safe from existing sources of disease, injury, and premature death) are hampered by armed conflict in a very similar way to those of prevention. A dearth of health professionals may be caused by a combination of preexisting scarcity (countries impoverished by war tend not to invest in institutes of higher education, such as nursing and medical schools) and an exodus of those who were qualified due to the insecurity caused by illegal actions by the warring parties. Whatever the cause, the human resource consequences are a significant handicap to any health protection activities. Restricted availability of other physical resources can also be an important contributor to poor health outcomes. The availability of food and medical supplies may be reduced by economic sanctions or blockades, such as has been the case in Yemen over recent years. This enforced poverty has impacts which cut across communicable and noncommunicable disease control, since malnutrition exacerbates the severity and fatality rates of many diseases, while a lack of medical supplies prevents effective treatment from being administered (MSF 1997; Lowcock 2018). The civil war in Yemen, the airstrikes, and external blockades which have accompanied it are a necessary root cause of the country’s 2017–2018 cholera epidemic – the largest in recorded history – which infected more than a million people (Camacho et al. 2018; Flecknoe et al. 2018). Sanctions or blockades which restrict the availability of food or medical supplies to conflict-affected civilian populations should be considered a war crime and opposed on humanitarian grounds. Effectively controlling outbreaks of communicable disease requires a number of processes to be in place and functional: firstly, the gathering of reliable information about confirmed cases, which insecurity and inadequate staffing make much harder to obtain; secondly, swift and effective treatment of those cases to prevent transmission of the disease to others; thirdly, the interruption of transmission pathways, whether these are person-to-person, via contaminated water supplies, or zoonotic vectors (all of these interventions require a functional public health infrastructure); and finally, the protection of vulnerable receptors (in the case of vaccine-preventable diseases) can be most easily accomplished through widespread targeted vaccination campaigns, which require significant demographic data, organization, and freedom of movement to accomplish. It should be apparent that every step of this process can be hindered or made completely impossible by active conflict in the area. On top of the increased susceptibility to communicable diseases caused by malnutrition (in besieged and blockaded locations) and overcrowding (in displaced persons camps), this makes conflict-affected populations almost uniquely at risk of communicable disease outbreaks. Vaccination and antibiotics are both, in their own ways, the paradoxical offspring of war. Progress toward effective mass vaccination campaigns has been inextricably linked with armed conflict, as military leaders realized that here was the best way to keep their troops fighting fit for battle. George Washington famously vaccinated his soldiers against smallpox, thus contributing to his victory in the American Civil War, and the first influenza vaccine was developed for use by the US army during World War II. Similarly, Alexander Fleming first stumbled upon penicillin during the wave of post-World War I influenza experiments motivated by the “Spanish flu” pandemic which wartime conditions so successfully spread around the world (Dehner 2012). It is tragically ironic that the human activity – war – which was so much of an inadvertent catalyst for both of these lifesaving discoveries is also a major obstacle to their effective use in the present day. The negative impact of armed conflict upon vaccination campaigns (which can be potent tools of both prevention and protection) has already been remarked upon. The negative impact of armed conflict upon antibiotic use, not only within the conflict zone itself but also globally, requires further explanation. Armed conflict frequently contributes, via factors already mentioned, to a lack of effective drug stewardship. Improper antibiotic prescribing, exacerbated by medication shortages and a lack of trained staff, has been shown to increase the prevalence of antimicrobial resistance. On top of this, population movements leading to reduced treatment compliance, the use of expired pharmacy stock, the destruction or looting of healthcare facilities, and the free availability of drugs in an unregulated marketplace all help to create a melting pot for the generation of antibiotic-resistant organisms (Gayer et al. 2007; Abbara et al. 2018). This is one of the several examples where local armed conflict can have international implications. Communicable diseases are no respecter of borders, and that very much includes newly multidrug-resistant organisms which can threaten the efficacy of routine treatment regimens in far distant countries. New pandemic diseases are only ever a single genetic mutation away, and armed conflict often leads to the mingling of previously immunologically isolated populations, the obscuring of data, and the destruction of protective health and risk identification systems. Syndromic early warning response systems have the potential to fill some of the gaps created by conflict, especially in resource-poor areas where laboratory diagnostic confirmation is a scarce commodity. However, a lack of reliable data is crippling to effective health protection interventions. Modern war zones are therefore extremely high-risk areas for the emergence of novel communicable diseases, and the inevitable delays in identification and control caused by the chaos of war make it very possible that such an epidemic could successfully metastasize and spread (Ismail et al. 2016). Ensuring that national and local surveillance systems remain flexible and responsive during times of crises should be highlighted as a key priority, as demonstrated during a large outbreak of dengue fever in the Solomon Islands in 2016–2017 (Craig et al. 2018). Modern war zones are high-risk areas for the spread of potential future pandemic diseases, but local surveillance systems are usually inadequate for the purpose of catching such outbreaks early. Syndromic early warning systems, and other potential means of mitigating this global threat, should be high-priority research areas. Global health partnerships such as the World Health Organization (WHO) have an important role to play in implementing a coordinated public health response in conflict zones. But these responses are often hampered by parochial sovereignty concerns and the level of cooperation provided by government, rebel, and insurgent groups. The 2013 Syrian polio outbreak, for example, itself an entirely predictable outcome of the civil war’s detrimental effect on preventative vaccination campaigns, demonstrated the regional inequalities that can be caused or exacerbated by armed conflict. Established early warning surveillance systems functioned only in government-controlled areas, and a fully effective public health response was only possible when led (in many areas) by nonpartisan NGOs in cooperation with neighboring countries, militant groups, and local grassroots organizations (Kennedy and Michailidou 2017). Similarly, protecting the population of the Democratic Republic of the Congo against the 2018 Ebola virus epidemic was fraught with complexity due to the minimal preexisting health infrastructure, entrenched animosities, and ongoing violence and required significant international intervention (WHO 2018b). Efforts to control and eradicate polio (theoretically possible, since it has no animal reservoir and the successful treatment of all existing patients could therefore permanently wipe it out) have been significantly hampered by armed conflict (Verma et al. 2018). At the time of writing, polio is only endemic to conflict-affected countries, most of which are in the Arab world (currently Afghanistan, Pakistan, and Nigeria). All of the previously identified logistical obstacles to comprehensive vaccination campaigns apply in these settings – infrastructure damage, general insecurity, and cold chain failure. On top of these challenges, suspicions about the motives of humanitarian NGOs attempting to conduct vaccination campaigns can be an additional obstacle. This distrust may well be exacerbated by instances of combatants posing as aid workers or the occasions when Western governments attempt to “take credit” for the humanitarian work of NGOs. Both of these actions can create the (usually false) assumption that international NGOs are acting in accordance with Western foreign policy (since many NGOs are based in Western countries). Widespread rumors that polio vaccines are contaminated, poisoned, or part of a plot to sterilize or otherwise weaken the local population may stem from this sort of mistrust. In Pakistan and Afghanistan, over 90% of local imams were at one time reported by the WHO to have campaigned against distribution of the polio vaccine on the assertion that it is religiously forbidden (Nishtar 2009). Needless to say, this also significantly reduced uptake. Building public trust, which is often in short supply in conflict-affected areas, is crucial to implementing effective prevention or health protection campaigns. Humanitarian NGOs should make transparency, honesty, and engagement with local stakeholders their priority when working in conflict zones in order to overcome suspicion and mistrust about their motives. Vector control programs are crucial for both the prevention of and protection from diseases that have either an animal reservoir or an animal host as a necessary part of their lifecycle. However, these programs can also be seriously disrupted by conflict, leading to avoidable increases in disease such as malaria, yellow fever, and dengue. The WHO Eastern Mediterranean Regional Office (EMRO) estimated more than five million cases of malaria in the region in 2015 with five countries accounted for the overwhelming majority of these cases: Sudan, Pakistan, Afghanistan, Yemen, and Somalia. It is unlikely to be coincidental that all of these countries are conflict-affected and face considerable associated challenges including but not limited to financial constraints, lack of prevention and monitoring programs, and an insufficiency of trained medical staff (Rowland and Nosten 2001; WHO 2017b). This concatenation of risk factors tends to result in uncontrolled outbreaks of communicable disease in conflict zones, and since these impacts also accumulate over time, the situation is likely to get progressively worse the longer a conflict drags on. In Syria, teams from Médecins Sans Frontières observed a distinctive dose-response relationship in which communicable disease prevalence appeared to rise dramatically with each passing year of conflict. For example, the proportion of outpatient consultations for under 5 years old that were recorded as being due to communicable diseases rose from 15% in 2013 to 51% in 2014 and up to 75% by 2015 (Meiqari et al. 2018). Reasonable protection against many of these diseases can be achieved locally through relatively simple procedures such as handwashing, mosquito nets, and good basic primary care. Their resurgence in any conflict zone therefore represents a serious indictment against the state in question for failing in its duty of care toward the civilian population. One of the lesser-noticed health impacts of armed conflict is the “opportunity cost” that it imposed upon a society caught up in it. An opportunity cost is the benefit or gains that are forfeited by choosing one alternative over another. For example, the opportunity cost of choosing to study medicine might be a successful career in a different field, as well as all the items that the money spent on medical tuition fees could have purchased. The most obvious opportunity cost of a decision to go to war is all of the positive benefit to a society in terms of protection from communicable and noncommunicable diseases that could have been accrued if the resources, time, and money that go into warfare were instead invested in public health. Box 1 illustrates one example of a very common opportunity cost of armed conflict (preventable micronutrient deficiency blindness) encountered by one of the authors. When political disputes are escalated into violence, it is usually at the expense of the citizens of which each side in the conflict claims to be the rightful representative. The impacts of this kind of willful neglect cut across all areas of health and well-being and are likely to lead to a widening of existing health inequalities. “I was sitting on the shady steps of the medical centre, scribbling notes for the next Pharmacy order, when a skinny girl of about seven years of age came out of the building and sat down next to me. I was so used to Sudanese children reacting to my white skin with a mixture of fascination and horror that I was positively thrilled by her disinterest – she barely even seemed to notice me, just sat staring up at the sky. I wished her a good afternoon in my faltering Arabic and she returned the greeting. We chatted for a little while longer, then she stood up and turned to go back inside. One thin leg pawed the air in search of the edge of the step while she supported herself on the doorframe, and her cloudy eyes, which I now saw properly for the first time, still stared sightlessly upwards. She was blind, of course.” – D Flecknoe. In the absence of either national or local government investment in protecting population health, whether through a lack of resources or a decision to invest resources elsewhere, international humanitarian NGOs will often intervene to fill the gap. However, foreign NGOs attempting to carry out health promotion activities often encounter significant obstacles to operating effectively. International staff may struggle to fully understand the local cultural context, beliefs, and taboos, which can render a public health campaign wholly ineffective or even counterproductive if not taken into account. Despite their best intentions to serve the local population, many NGOs are functionally more accountable to their donors than to their beneficiaries, and foreign donors are likely to have even less insight into the health needs of the population than international staff in the field. This makes it vital that health promotion and protection interventions by humanitarian NGOs are informed by extensive community engagement throughout the project cycle. In order to be effective and credible, public health interventions must be driven by the needs of the local population, not by the perceptions of either foreign donors or NGO staff. Comprehensive community engagement is therefore necessary to inform and steer such interventions. The detrimental impact of conflict on the educational system can also have health impacts over time, particularly on the control of noncommunicable disease. The public provision of education is likely to be affected in very similar ways to the provision of healthcare – infrastructure damage and an exodus of trained professionals leading to a reduction in the quality of service that can be provided. Long-standing conflicts therefore result in adult populations with very low levels of health literacy, and unscientific beliefs about disease causation are likely to predominate (such as the idea that mental illness is a result of demonic possession), making effective health promotion and improvement activities all the more challenging. A chronic lack of secondary education in an area is also likely to contribute to a dearth of locally trained medical personnel, meaning that NGOs will be forced to import more staff, either from other parts of the country or by using international volunteers. As discussed above, this necessity carries with it the inherent problem of cultural differences between health workers and beneficiaries, which often require significant investment of time and resources to overcome in order to be able to deliver effective health protection interventions. Armed conflict thereby both simultaneously creates a problem and frustrates its solution. Public health emergencies, including armed conflicts, have the potential to generate large and severe health, social, and economic consequences that cannot be contained by existing national infrastructures. Contingency plans to adequately prepare for, detect, and respond to public health emergencies are therefore in the best interests of nation-states. The concept of public health emergency preparedness (PHEP) has been defined as “the capability of the public health and health care systems, communities, and individuals, to prevent, protect against, quickly respond to, and recover from health emergencies, particularly those whose scale, timing, or unpredictability threatens to overwhelm routine capabilities” (Nelson et al. 2007a). From a public health perspective, emergencies tend to be characterized by disruptions in essential services, such as utilities, transportation, and food supply, and may not necessarily connote the sense of a sudden and unexpected disaster. In the Middle East, which is the most unstable region in the world according to the 2018 Global Peace Index (Eldis 2018), the need for PHEP has never been greater. As already discussed, armed conflict increases the likelihood that future public health emergencies (such as large outbreaks of communicable disease) will occur. Through many of the same mechanisms, it also degrades a nation’s ability to undertake the sort of risk assessments, planning, and preparation which are vital components of effective PHEP, so as to be able to mitigate those emergencies. As is so often the case, groups that are already deprived and vulnerable are most at risk from this lack of effective planning. Communicable disease outbreaks frequently exhibit a steep inequality gradient in terms of morbidity and mortality, meaning that the poor and socially isolated, displaced, and socially stigmatized populations generally suffer the greatest consequences. Innovative strategies are required to address these risks and prevent existing inequalities from being further compounded by a lack of effective preparation (WHO 2008; Gonzalez et al. 2018). The impacts of population movements out of conflict zones, including an exodus of trained healthcare workers, on health system capacity within those conflict zones have already been mentioned. In terms of wider impacts, it is also worth discussing capacity issues in the non-conflict areas which receive these (often very large) population movements. Many of the risk factors for both communicable and noncommunicable disease outbreaks generated within the war zone from which a population is fleeing will travel with them to their new, otherwise safer location. However, on arrival those factors can be exacerbated by overcrowding, isolation, lack of health information, and linguistic, cultural, or religious barriers to adequate, timely, and appropriate healthcare in the receiving countries or areas. The huge burden placed upon countries such as Jordan and Lebanon by the Syrian Civil War and the emergence of disease outbreaks in both the host and displaced populations are an example of this phenomenon (Nimer 2018). The PHEP requirements imposed by armed conflict are therefore often not confined within national borders but are also imposed upon surrounding countries and continue well into the post-conflict phase, as will be discussed below. The most readily apparent direct public health consequence of armed conflict is the increased burden of injuries and deaths which are caused by violent attacks. Not unlike mental health impacts, for the purposes of our discussion, these fit best into the “noncommunicable” category, despite having an undeniably contagious and self-perpetuating quality. It is worth noting that in the Nelson et al. definition of PHEP, responsibility for planning and mitigation is not solely restricted to government agencies but also civil society and nongovernment groups. This is significant given that many first responders to public health emergencies are from the local civilian population. A recent example can be seen in White Helmets/Syrian Civil Defence organization, a volunteer group of 2,900 rescue workers that have reportedly saved over 80,000 lives in the ongoing civil war (Fouad et al. 2017). Integrating PHEP across national systems is crucial but may be challenging in conflicts where political differences prohibit collaborative working. For example, the White Helmets currently restrict their activities to selected nongovernment-controlled areas of Syria due to the Assad regime’s classification of them as terrorists. The proliferation of online “fake news” propaganda against groups whose existence and work are embarrassing to various warring parties (including international governments) only increases the fog of war with regard to reliable data for health systems planning and preparedness in this and other conflicts (Starbird et al. 2018). Assessing the readiness of a health system to prevent, detect, and respond to emergencies is a challenging component of PHEP. Policy-makers’ investment in PHEP can be stifled without clear definitions of performance indicators against which to measure progress. Numerous frameworks and tools exist to assess readiness, but these are generally fast-moving and are not well-represented in the peer-reviewed literature, given the newness of PHEP in modern public health service provision. Conceptual frameworks tend to involve a classic “structure-process-outcome” theme, although the evidence base linking these three components is relatively thin (e.g., often because it is harder to evaluate outcomes than structures). A commonly used tool to assess PHEP includes written assessments, which can vary widely in scope but could involve self-reported questionnaires assessing generic preparedness (e.g., the Public Health Preparedness and Response Capacity Inventory), specific staff competencies (e.g., Core Public Health Worker Competencies), or narrative performance reports. Another commonly used tool is group exercises, which can be either discussion-based (e.g., group tabletop discussions about a particular scenario) or operations-based (e.g., undertaking active drills following simulated intelligence) (Nelson et al. 2007b). It is obviously much easier to facilitate exercises of this kind, which help to assess health system readiness for catastrophic shocks (such as armed conflict), in times of peace. Written reports by stakeholder organizations are cost-efficient, low resource intense options for assessing PHEP capacity, but obvious drawbacks include their tendency to focus more on public health structures and to be biased given that such assessments are self-reported. Multiagency exercises could provide a better indication of preparedness than written assessments but are often financially and human resource intense, without standard metrics of what constitutes adequate performance (ibid). International agencies such as the WHO would be well advised to invest more effort in strengthening and testing the systems designed to protect civilian populations from both the direct and indirect health impacts of armed conflict. Efforts to test the resilience and effectiveness of public health emergency preparedness (PHEP) should be designed to assess both systems and outcomes and should not only rely on self-reporting. Resilience is the ability of a health system to sustain or improve access to healthcare during shocks, such as armed conflict, while ensuring long-term sustainability. Thomas and colleagues break down the definition of health system resilience into three domains. “Financial resilience” refers to the protection of funds for healthcare, particularly that of the most vulnerable sections of a population. “Adaptive resilience” pertains to the ability of government and providers to manage the system with fewer resources through efficiencies while not sacrificing key priorities, benefits, access, or entitlements. Finally, “transformatory resilience” is the ability or capacity of a government to design and implement desirable and realistic reform when the current organization, structures, and strategies are no longer feasible (Thomas et al. 2013). This model of health system resilience indicates the complexity of the PHEP challenge to be faced, even when a government is committed to planning for the health of its population. Other researchers on this topic have proposed a health system resiliency index that encompasses 25 indicators, including the distribution of health system assets, health system utilization, and a functioning civil registration and vital statistics system (Kruk et al. 2017). Such indicators can be difficult to measure in low- or middle-income countries even in times of peace, and during times of armed conflict, accessing reliable and valid data securely and on a regular basis becomes ever more challenging. In appreciation of this challenge, the World Health Organization has implemented a “Health Resources and Services Availability Monitoring System” (HeRAMS) in several conflict-affected countries: the Central African Republic, Fiji, Mali, Nigeria, the Philippines, Syrian Arab Republic, and Yemen (WHO 2018d). This system aims to monitor the availability of health services during an emergency and goes some way toward understanding health system resilience in conflict-affected countries. Adequate PHEP can strongly lend itself to improving health system resilience, and using data from the Health Resources and Services Availability Monitoring System (HeRAMS), there are clear examples where public health emergencies in the form of armed conflict may have overwhelmed health system capabilities. For example, Fig. 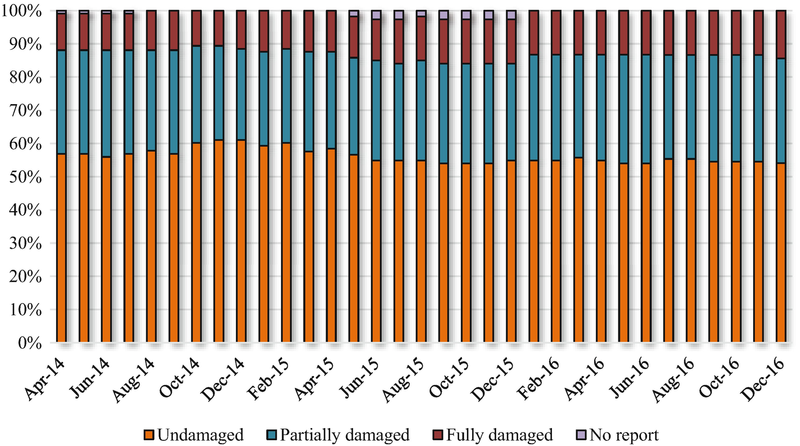 1 presents the HeRAMS results of a broad assessment of damage to public hospitals in Syria (WHO 2018e). 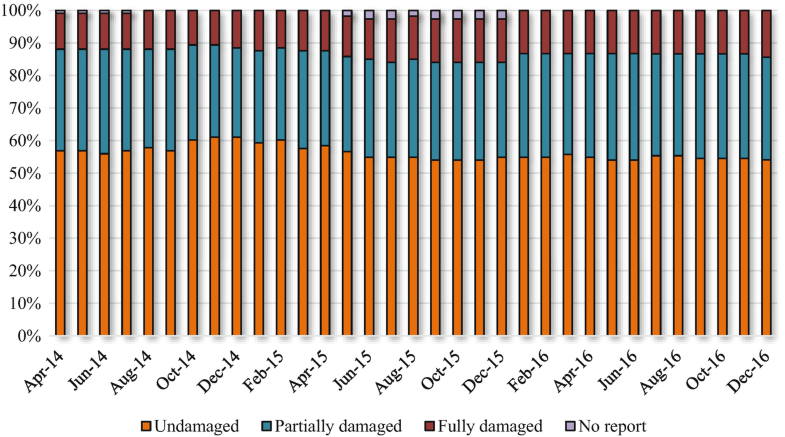 In this assessment, around 50–60% of hospitals remained undamaged between 2014 and 2016, and 10–15% of hospitals were fully damaged or destroyed. Given the lack of clear trends, this may suggest that most damage to public hospitals occurred prior to the commencement of surveillance, that is, sometimes between 2011 and 2014, with little or no repair or rebuilding having been possible during the time period surveyed. The extent of damage to healthcare infrastructure appears to have been worse in conflict-affected Yemen, and although trends were unavailable for analysis, only 45% of health facilities were fully functional in 2016. This may reflect a less resilient health system at the pre-conflict baseline (WHO 2018f). Further examples of low health system resilience in Syria and Yemen can be found using HeRAMS data. In Yemen, there were no medical doctors in 49 out of 276 surveyed districts and only 2 doctors or less in 42% of surveyed districts in 2016 (WHO 2018f). In Syria, it was reported that half of the 30,000 doctors thought to be practicing prior to the conflict left the country following the start of the civil war (Karasapan 2016). A similar proportion were reported to have left neighboring Iraq since the US-led invasion in 2003 (Mohammed 2010). Adapting health systems to such a catastrophic shortage of healthcare workers and human capital in these countries poses huge challenges to maintaining the health of their populations and the financing of their health system. As mentioned above, it is not only countries undergoing armed conflict that need to be mindful of the resilience of their health system, as neighboring countries too can feel the indirect destructive effects of war. As well as the pressures that have been placed upon the health systems of Jordan, the Syrian Civil War has also forcibly displaced over one million Syrians into neighboring Lebanon. An analysis of health system resilience in Lebanon in 2014–2015, using secondary data sources from the Lebanese Ministry of Public Health, generally showed a surprisingly resilient system (Ammar et al. 2016). For example, financial resilience (from the Thomas et al. model discussed above) was demonstrated by changes in patterns of public spending on health to meet the needs of arriving Syrian refugees, even though these changes were considered not in proportion to those needs and had to be supported by money from international donors. In another example, transformatory resilience was considered present after the initial “parallel” health system created by humanitarian agencies in Lebanon was integrated with the National Health Service to provide a more coordinated and less fragmented approach to healthcare in the country (ibid.). By 2015, the Lebanese government and its stakeholders had established 20 new public health centers and directly supported 100 private health centers, increasing primary care capacity by 40% (Kruk et al. 2017). There is a great deal to learn from the innovative and integrative (but frequently underreported) success stories in those countries that have received the overwhelming majority of Syrian refugees. The global health community as a whole has much to learn from both the successes and failures that have accompanied efforts to manage the huge population movements resulting from the Syrian Civil War. This is a rich area for high-value research to inform future PHEP. Although the definition of a “post-conflict” state remains in many instances unclear (Haar and Rubenstein 2012), there are some commonalities. After the cessation of active violence, by whatever means it is achieved, the negative impacts created by the violence almost all still pertain. The rebuilding and restaffing of a functional public health system are not achievable overnight, and many of the humanitarian aid organizations that have been filling the gap during the conflict are likely to withdraw once it is over. The deficit between the supply and demand for medical services can often thereby increase, rather than decrease, in the aftermath of war. The tensions and hostilities that led to violence are usually still present to a large degree, and all of the basic development needs generated by it (such as education, transportation, water, and electricity) will remain, at least in the short term, unfulfilled. This is a dangerous time, when there is a high probability of a resumption of conflict without significant diplomatic and development interventions. Effective approaches to post-conflict reconstruction can be based upon the World Health Organization’s six health system building blocks: leadership and governance, health services, health information, human resources, financing, and access to essential medicines, vaccines, and technologies. Yet achieving stronger health systems in post-conflict settings remains challenging for a number of reasons. Spiegel (2017) has described the humanitarian system, which traditionally includes governments, donors, multilateral and bilateral agencies, international and national nongovernmental organizations (NGOs), community-based organizations, UN agencies, and international agencies such as the International Committee of the Red Cross, as no longer fit for purpose in this regard. The existing humanitarian model centers on relief rather than development, often aiming for rapid resolutions rather than long-term sustainability. This approach, known as the humanitarian-development nexus, is regularly uncoordinated with and runs in parallel to existing national infrastructures, which can negatively affect state legitimacy and be potentially destabilizing. In recent conflicts, humanitarian actors have been working more closely with development organizations in recognition of this problem, but it has not yet been fully solved. Humanitarian NGOs are advised to move away from the traditional paradigm of “aid” and “development” as nonoverlapping endeavors. Integrated working to alleviate current adverse conditions while also working to build and develop local capacity will result in more sustainable positive outcomes for the local population which can then continue into the post-conflict phase. Reinvestment and rebuilding in post-conflict societies are not only for the purpose of undoing the damage created by conflict but also have a preventative effect against future conflicts. In the longer term, stronger health systems lead to a healthier society, more economic growth, and political stability and therefore reduce the likelihood of any renewal of violence (Collier et al. 2009). Good governance is required to oversee the kind of post-conflict investment which appears, since some commercial enterprises which are extremely detrimental to population health – such as the tobacco industry – may also be the most reactive to new markets, leading to an increase in noncommunicable diseases in the post-conflict phase (Roberts et al. 2012). Some increased reporting of all types of disease is to be expected as surveillance systems are rebuilt and strengthened, however, and this can be hard to separate from the “double burden” health impacts of the transition to a more affluent peacetime lifestyle. As tobacco use is one of the main risk factors for noncommunicable disease and tobacco industries are often among the first to establish themselves in the post-conflict setting, more research attention should be paid to this variable. Public health practitioners and policy-makers should be mindful that many diseases may be under-recorded and underdiagnosed during times of armed conflict, so a post-conflict rise in recorded prevalence is to be expected, especially if economic growth results in higher uptake of the unhealthy “Western” behaviors, e.g., physical inactivity, consumption of unhealthy foods, tobacco and alcohol use, etc. The risk that armed conflict poses to global health is partly inherent in the use of mass violence to advance political goals but also arises from the contemporary trend of warring parties failing in their duty to abide by International Humanitarian Law. The deliberate targeting (or negligent destruction) of civilian and health infrastructure, the endangerment of health workers, and subjecting a population to starvation, unnecessary forced displacement, and other cruelties are war crimes which should not be normalized. As well as the direct toll of morbidity and mortality that they bring in the form of short-term injuries and deaths, these actions dramatically increase the risk of communicable and noncommunicable disease incidence and simultaneously reduce the ability of a society to prevent and control such risks. Armed conflict degrades the capacity of health systems to gather vital data and plan effectively for future emergencies, and all of these impacts can persist long after the guns have fallen silent. A fuller understanding of the many and various ways that warfare affects public health (in the separate but linked senses of the professional discipline and the collective health of the public) would be highly beneficial to international policy-makers, humanitarian workers, and health professionals of whatever background who work (or are planning to work) in or near conflict zones. In order to be effective and credible, public health interventions must be driven by the needs of the local population not by the perceptions of either foreign donors or NGO staff. Comprehensive community engagement is therefore necessary to inform and steer such interventions.